David Dawson began his career performing with the Ft. Worth Symphony and Dallas Symphony while still in high school and has since been a member of the San Antonio Symphony and the Orchestra of Santa Fe. 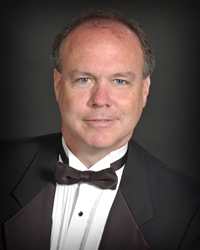 David is currently engaged as Assistant Principal Bassist for Austin Lyric Opera and the Austin Symphony, and is a frequent guest in chamber music series such as the Chamber Soloists of Austin and Camerata San Antonio. He has performed with many jazz/popular music groups and in 1988, he won a Grammy Award for his recording with Texas Swing Group Asleep at the Wheel. He has performed on numerous television and radio broadcasts including Austin City Limits and Lonesome Pine Special. He has played Baroque Double-Bass with the Texas Baroque Orchestra, the Handel-Haydn Society of Austin, and Cappricio Stravagante at the Longy Baroque Institute of Boston.